If you’re new here, a few MonDEES ago, Branden M had given us a pic of him rearranging some Christmas stockings in a very delightful way! You can see that blog post here. We challenged yinz all to send in some more pics..without damaging any property and this thing has been rolling for quite some time. Each day, the submissions are getting more creative. Target was out of the letter “j” so I had to improvise. But ya gotta appreciate the dedication to the mission! 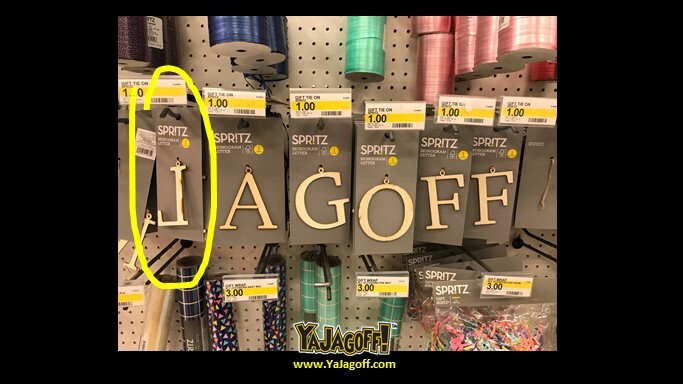 As highlighted by the Jagoffestrator, they had to improvise because there were no J’s and a backward L sufficed perfectly! Hey… maybe this is part of the secret to getting the word JAGOFF on a license plate! Ok..only a few more days of this and then we vote for the best ones! Someone is gonna win a prize so keep going, Ya Jagoffs! Thanks @YinzerExPat on Instagram for being today’s Jagoff-atier and thusly an Honorary Jagoff Catcher!